The Patriot Legal Expense Fund Trust has raised $180,000 to help pay massive legal bills accumulated by President Donald Trump’s aides who are caught up in the Robert Mueller investigation. Fundraising for the Patriot Fund is expected to kick into high gear soon, said one source, who added, “The president really wants to make sure his people are taken care of because they’re getting screwed,” Paul Bedard reported for The Washington Examiner on Aug. 6. Work on organizing the fund began in late February. The Patriot Fund is similar to a defense fund that was established to assist former President Bill Clinton with an array of scandals. The group behind the Clinton fund raised some $8.7 million, much of which went to paying the ex-president’s bills, Bedard ntoted. The Patriot Fund will help Trump aides who have not been charged and are not targets of the Mueller probe but have had to hire legal help because of the Russia probe, in many cases to prepare to testify, Bedard’s report said. The Patriot fund was created Feb. 27 and most of the past months “have been spent setting it up and clearing hurdles such as securing insurance and legal and accounting help,” Bedard wrote. The U.S. Office of Government Ethics said the fund is in compliance with federal rules. 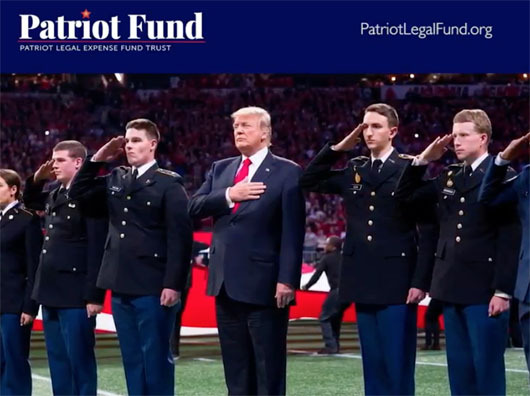 “A lot of attention was placed on the details of the formation of the Patriot Legal Expense Fund to ensure the highest standards and compliance to ethics statutes. The important work has now begun to raise contributions that will be passed on to patriots who have served their nation and President Trump but are struggling with extraordinary legal expenses from their willing cooperation with the Russia investigations,” said a source familiar with the operations of the Patriot Legal Expense Fund. “The process has just begun in earnest to raise substantial contributions. The Patriot Fund is reaching out to potential major donors and planning small donor appeals as well. The process of assessing the list of recipients of fund contributions has also started so their legal expenses can be covered in the near future,” added the source.